Presidential hopeful and my favorite candidate up to now is dropping out of the race for the presidency. He will make his announcement in New Orleans, the same place where he launched his campaign. John Edwards always acknowledged that it was a two person race, Clinton and Obama, and tried to compete. His campaign for the working persons of America never really caught on. 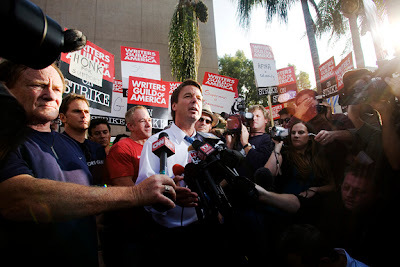 Edwards was the only candidate to visit, support, and picket with the WGA outside of the NBC studios in Burbank.